I'm in Europe for the next two weeks, doing some research and getting some (in my opinion) well-deserved R&R. I may post some observations while traveling, but then again, I might not. Reliable broadband 'net access is still a pipe dream in some places. We'll see. Meanwhile, chew on the notion that Europeans tend to look at Americans with a mixture of pity , sympathy, condescension and smugness. Sure, the EUSSR is destroying itself from within as well - but that self-implosion is far less obvious than the teetering dollar, the Iraq fiasco, and the circus that is the presidential election. Still, "always look on the bright side of life" eh, GF? I have read some of your articles on antiwar.com and would like to ask a question. I presume you speak and write Serbian. 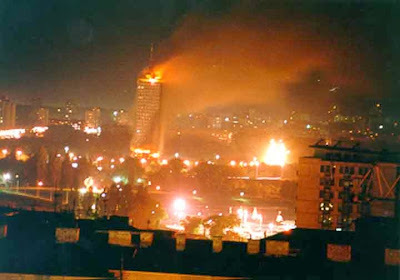 In your June 26, 2003 article for Antiwar.com you reviewed Yugoslavia: Death of a Nation by Laura Silber and Allan Little. I am interested in why you did not challenge any of their translations of Milosevic speaches. I refer specifically to his speech in Kosovo on 24 April 1987 which translation appears in Yugoslavia: Death of a Nation by Laura Silber and Allan Little on p.38. The phrase in question "You should stay here for the sake of your ancestors and descendants. Otherwise your ancestors would be defiled and descendants disappointed" appears to me and others to have been mistranslated. According to Diana Johnstone, the original Serbian phrase was "Treba da ostanete ovde zbog predaka i zbog potomaka. Pretke biste obrukali, potomke razocali". Silber and Little translated the word obrukali as 'defiled' while Johnstone and Szamuely say it should be 'shamed'. In my online Serbian dictionary it is translated as "disgraced" or "dishonoured" (1). Considering this translation has been consistently used by the pro-Nato and pro-war commentators such as Roger Cohen, I am somewhat confused as to why you didn't challenge this translation at the time. I wouyld be gratefuk for any comments you could give on this. That's a valid point, dailysketch. Nor am I surprised that Cohen, that slimeball, twists the words and meanings to make his mendacious point. Milosevic's famous speech is routinely mistranslated (even though there *are* accurate translations out there, some even done by the very Western media that keep using the twisted one), and Jared Israel of Emperor's Clothes did a great job of exposing those mistranslations as such. He's also published the speech in its correct translation. When I wrote the review of Silber and Little's propaganda tract masquerading as history, I was more interested in encompassing the full scope of their deception, and chose not to dwell on the details such the mistranslations (deliberate and malicious, yes) of the speech. THank you for bringing this up, though - I'll address is in a future blog post. Have a nice time in the EUSSR Mr.Falcon. Will you perhaps visit the Balkans? I hear it is election times and the rallies have started in both Serbia and the Serb enclaves in Kosovo. A couple of questions. As a libertarian, what is your view of the radical party in Serbia? They seem to have wind in their sails right now. Do you think this is good for Serbia? And if they win, what will it mean for Kosovo? Finally, what do you think it will mean for the cooperation between Serbia and Russia? I'm doing some background research on the term "Merciful Angel" as metaphor for NATO's 1999 Operation Allied Force, and wondered if you could help me identify the origin -- if not specific originator -- of the term. Until about a year ago, I had not thought to question whether this phrase was in fact coined by NATO chiefs. But after stumbling upon and reading your Balkan Express column of August 30, 2001, I began digging the Web as well as academic sources for attributions. In ten months of searching I'm at a dead end. I can't find a primary source -- let alone a verifiable secondary source -- for the phrase, only vague allegations about its history. I appreciate any assistance you can give me. Please could you post the internet links to those accurate translations? I presume one can find Jared Israel's translation of the speech on his website? I look foreward to reading your future blog post on the subject. I will also let you know any results of my enquiries - I am currently in the middle of e-mail exchanges with both Cohen and Silber.